The court granted defendant's motion to exclude the testimony of defendant's damages expert concerning a reasonable royalty rate as unreliable. "[Defendant] contends [the expert's] opinion is inadmissible because it considers the Georgia-Pacific factors without regard to a starting point—that is, a starting royalty rate which varies up or down based on the expert’s application of the Georgia-Pacific factors. . . . Rather than identifying a starting royalty rate, [the expert] contends there are no comparable licenses in the record on which to base his Georgia-Pacific analysis. Instead, he opines that [plaintiff] would not accept less than a 27.6% royalty, which is derived from his lost profits estimate, and [defendant] would not accept a royalty rate higher than 36.5%, the average of its gross profit margins on the [accused] Cooler. . . . He concludes with his 'conservative' estimate of a 29% royalty. The fundamental flaw in this analysis becomes clear when one tries to identify exactly what [the expert] was pushing up or down based on each Georgia-Pacific factor. Without some identifiable and relevant rate to which these factors are applied, the factfinder is unable to evaluate how the expert reaches his final number. This ipse dixit justification is the hallmark of an unreliable methodology." Following a bench trial, the court found that plaintiffs' antipsychotic drug patent was not invalid for unpatentable subject matter because the claims contained an inventive concept. "The patent-at-issue in this case addresses natural relationships to which the claims add conducting CYP2D6 genotyping tests to determine the appropriate dose of iloperidone to reduce QTc-related risks. . . . The court finds it persuasive that the dosage step in the [patent] does not apply to all patients, but only a specific patient population based upon their genetic composition. The dosage step requires applying genetic tests in a highly specified way. Moreover, the process of using this genetic test to inform the dosage adjustment recited in the claims was not routine or conventional and amounted to more than a mere instruction to apply a natural relationship. This combination of elements is sufficient to ensure that the claims amount to significantly more than just a natural law." The court granted in part defendant's motion to exclude the testimony of plaintiff's damages expert as unreliable for relying on a prior settlement license involving the patent-in-suit. "In reaching his baseline estimate for damages, [the expert] relied on a previous license agreement involving the patent-in-suit. The previous license agreement, however, was made in the context of settling a litigation dispute, and thus did not reflect the royalty the parties would have reached 'just before infringement began.' Therefore, the damages amount arrived at in the settlement agreement had to be translated into a damages number that the same parties would have arrived at just before infringement began had they, instead, assumed that the patent was infringed and valid. This implies that the amount of the previous settlement would need to be increased to arrive at the royalties that would have been agreed to in a hypothetical negotiation. . . . [Plaintiff's expert] attempted to account for this discrepancy by estimating the discount factor the parties used when negotiating the previous license agreement. . . . The estimate did not consider the nature of the patent-in-suit, the accused products, or either party's litigation strategy. Instead, the estimate was based on a study that found that 'patent holders tend to prevail approximately 40% of the time' in the District of Delaware. The Court agrees with [defendant] that [the expert's] estimate approach is not reliable as it is not sufficiently tied to the particular facts of this case." Following a $3.5 million jury verdict, the court granted defendant's motion for a new damages trial because plaintiff's damages expert used an improper proxy for the operating system in the accused products. "[Plaintiff] based its damages analysis on the value of the Android operating system in [defendant's] accused products . . . [The expert] used an estimated value of the non-accused Windows Mobile operating system as a substitute for determining the approximate value of the accused Android operating system. . . . [T]he Court finds [the expert's] opinion that the Windows Mobile operating system could serve as an acceptable substitute for valuing the Android operating system to be conclusory and wholly unsupported by the evidence. The Windows Mobile operating system is clearly not the smallest salable patent practicing unit, as there is no evidence that it practices the patent and it was not an accused product at trial. At best, its alleged 2008 cost is roughly analogous to a comparable license. However, [plaintiff's expert] did not testify as to whether Windows Mobile is technologically or economically comparable to Android, and he failed to account for any differences between the two products. Absent such testimony, the Court concludes that [plaintiff] failed to offer sufficient evidence for the jury to find that Windows Mobile is an acceptable economic substitute or that it bears any relationship to 'the incremental value that the patented invention adds to the end product.'" ​ The court granted defendant's renewed motion for judgment as a matter of law that it did not willfully infringe plaintiff's patent following a jury finding of willful infringement because of insufficient evidence. "[T]he trial record contains insufficient evidence to support the jury’s willfulness finding, even under a preponderance of the evidence standard. It is undisputed that [plaintiff] never actively informed [defendant] of any of its patents or patent applications before [plaintiff] filed this lawsuit. . . . The only direct evidence that [plaintiff] offered to show that [defendant] was subjectively aware of [the patent-in-suit] before this suit commenced was a Notice of Allowance for [a defendant] patent sent to [defendant's] outside patent prosecution counsel [4 months before plaintiff filed suit], which [defendant's] outside counsel then forwarded . . . to [defendant's] in-house counsel. . . . [T]he Notice of Allowance did not discuss or attach the [patent]. . . . While the notice recited the name of the lead inventor of the [patent] — [plaintiff's CEO] — the notice made no mention of [plaintiff] itself. . . . To the extent that [plaintiff] argues that [defendant] or its outside counsel had a duty to review the [patent] when they saw its number listed in the Notice of Allowance, [plaintiff] is incorrectly suggesting that willfulness can be proven by negligence; the Supreme Court has ruled that 'intentional or knowing' infringement may warrant enhanced damages." Where Do TXED Cases Go? Anyone with a knowledge of the current patent infringement lawsuit landscape in the United States has more than likely noticed one court venue which has seen a huge influx of patent cases. The U.S. District Court for the Eastern District of Texas (E.D. Tex.) has seen an extremely large number of patent infringement cases on its docket, prompting some to go so far as to suggest that legislation limiting venue options should be pursued by Congress. A plaintiff’s choice of venue in patent infringement cases is defined by Section 1400(b) of U.S. Code Title 28, which states that civil actions for patent infringement may be brought in the judicial district where the defendant resides or where the defendant has committed infringement and has a regular and established place of business. Because patent infringement plaintiffs can bring action in a venue where the defendant is doing business and not where it is headquartered, both the cost and inconvenience of defending a case in a distant venue may be reason enough for file a motion for a transfer of venue. Legal teams preparing a defense for a party in a patent infringement suit filed in E.D. Tex. might find effective strategies for arguing a transfer of venue by investigating what has worked for others in the past. It’s not that rare to find cases in E.D. Tex. which have seen a motion to transfer venue granted. As of this writing, in 2016 alone, there have been nearly 50 patent infringement cases which have been transferred out of E.D. Tex., with 19 of those cases ending up in the U.S. District Court for the Northern District of California (N.D. Cal.). One such case which was successfully transferred is Game and Technology Co. Ltd. vs. Blizzard Entertainment, Inc. et al. Game and Technology Co. brought suit against Blizzard and others, including Valve Corporation and RIOT Games, in E.D. Tex. over a trio of patents related to video gaming and online gameplay. The court granted the motion to transfer venue based on the fact that the relevant evidence and witnesses were more easily found in the districts identified by the defendants. Blizzard does business in the area covered by E.D. Tex. but the primary function of that office was customer support. The cases involving Blizzard and RIOT were directed to the U.S. District Court for the Central District of California (C.D. Cal. ), while Valve’s case was transferred to the U.S. District Court for the Western District of Washington (W.D. Wash.). Another E.D. Tex. case in which the defense’s motion to transfer venue was successful is Intelligent Automation Design, LLC vs. Zimmer Biomet Holdings, Inc. et al. The patent-in-suit protects a method of controlling how screws are seated to prevent them from becoming stripped. Biomet Microfixation, one of the case’s defendants, petitioned for a transfer of venue based upon the fact that a previous case involving a Zimmer company was transferred out of E.D. Tex. for convenience. Biomet Microfixation also noted that it has no offices or facilities in Texas as well as the fact that the accused system was developed in the Kansas City region. The case was transferred to the U.S. District Court for the Middle District of Florida (M.D. Fla.), which is where Biomet Microfixation’s headquarters are located. There are dozens of recent patent infringement cases which legal teams can analyze to determine successful strategies for motions to transfer venue. 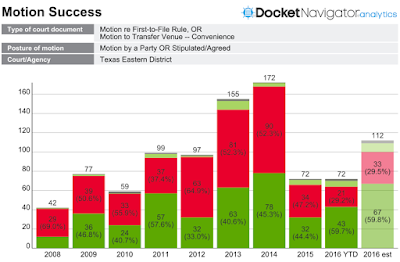 Docket Navigator gives attorneys the analytical tools they need to quickly find granted motions regardless of the district court within which the case was originally filed. Charts made using Docket Navigator's data. This guest post was written by Steve Brachmann. The court granted plaintiff's motion in limine to preclude defendants' damages expert from testifying at trial as unqualified. "[T]here is merit to plaintiff’s argument that [defendants' expert] 'does not do what he is qualified to do and is not qualified to do what he does.'. . . [The expert] explicitly claims to provide an 'economic analysis' in support of his opinions, which purport to apply concepts drawn from the 'economic subfield' of 'industrial organization, and specifically antitrust economics.' Yet [his] graduate studies did not include coursework in economics or any of its subfields, nor does [he] hold a degree in economics or accounting — two fields from which damages experts commonly emerge. . . . At best, the record establishes that [the expert] has expertise in the fields of Bayesian statistics (which, he explained, 'deals specifically with the introduction and incorporation of subjective probability assessments integrated with – in settings in which data is unavailable,' and economic modeling. But [he] denied conducting 'any kind of Bayesian analysis' to arrive at his opinions in this case, and nothing in his report suggests that he performed any economic modeling. . . . [D]efendants insist that he is not 'being offered up as "an economist,"' but rather as 'a damages expert and economic modeler.' As just noted, however, defendants do not point to any portion of [the expert's] report in which he performs economic modeling, and none of the authorities they cite suggests that 'damages expert' is a recognized field of expertise." In a final written decision, the Board found claims of a patent directed to a computerized method and system to provide personalized nutritional information to consumers unpatentable under 35 U.S.C. § 101. "Relying on the distinction made in [Alice Corp. Pty. Ltd. v. CLS Bank Int’l, 134 S. Ct. 2347, 2354 (2014)] between, on one hand, computer-functionality improvements and, on the other, uses of existing computers as tools in aid of processes focused on 'abstract ideas,' the court in [Enfish, LLC v. Microsoft Corp., 822 F.3d 1327, 1335 (Fed. Cir. 2016)] clarified that a relevant inquiry in step one of the Alice framework is to ask whether the 'focus' of the claims is on the specific asserted improvement in computer capabilities or, instead, on a process that qualifies as an 'abstract idea' for which computers are invoked merely as a tool. . . . [T]he challenged claims in this case, contrary to Patent Owner’s assertion, are not directed to a barcode entry device, personal data related to the individual, and prestored nutritional data, because the claims are not focused on any specific improvement in the functioning of a barcode reader or a nutritional database. . . . [W]e determine that . . . the focus of the challenged claims is on collecting and correlating information, a process that qualifies as an 'abstract idea' for which conventional components, such as a barcode reader, data input devices, a processor, and a nutritional database, are merely invoked as tools used in their ordinary and conventional manner." Following a jury verdict of willful infringement, the court denied plaintiff's motion for enhanced damages because of defendant's absolute intervening rights defense. "At the summary judgment stage, the Court granted [defendant's] motion for summary judgment in its favor on its defense of absolute intervening rights. . . . Thus, the period of infringement in the present case began [8 months ago]. This fact is important to the Court’s analysis because, in [Halo Elecs., Inc. v. Pulse Elecs., Inc., No. 14-1513 (June 13, 2016)], the Supreme Court explained that an infringer’s culpability should be measured at the time of the challenged conduct. . . . Under the Court’s intervening rights ruling, [defendant] is not liable for any sales of [the accused] capacitors that occurred prior to [8 months ago]. Therefore . . . [defendant] had already been permissibly selling the accused products without being subject to damages liability for almost six years. Moreover, at the time infringement began, [the parties] were well into the present litigation. . . . [T]he Court declines to find that the willful infringement that occurred in the case after [intervening rights applied] constitutes an 'egregious' case of misconduct warranting an award of enhanced damages. Rather, the present action was a 'garden-variety' hard-fought patent infringement action between two competitors." The court denied defendant's motion to dismiss plaintiff's amended complaint on the ground that plaintiff’s identity protection patent encompassed unpatentable subject matter because claim construction had not occurred. "The Court granted the motion to dismiss [the original complaint] on the grounds that the patents are invalid because they are drawn to an abstract idea. . . . The Court is persuaded by the additional briefing that it should not make a final decision about patent eligibility until after claim construction has occurred. Defendants contend that 'it is the claims — not the specification or figures — that matter.' However, the Federal Circuit [in Enfish, LLC v. Microsoft Corp., 822 F.3d 1327 (Fed. Cir. 2016)] recently clarified the two-step process of determining whether a patent’s subject matter is eligible for patent protection. It described 'a stage-one filter to claims, considered in light of the specification, based on whether 'their character as a whole is directed to excluded subject matter.''. . . In its decision, the Federal Circuit reversed the district court. This reversal was largely based on the Federal Circuit's finding that 'the district court oversimplified . . . the claims and downplayed the invention's benefits.' By first allowing claim construction, the Court hopes to avoid that situation in this case." The court granted defendant's motion to exclude the testimony of plaintiff's damages expert regarding a reasonable royalty base as unreliable. "[Defendant] moves to exclude [the expert's] testimony on the grounds that she improperly inflated the royalty base by double or triple counting revenue attributable to certain features of the accused products. . . . [The expert's] method of counting the revenue attributable to certain features multiple times, when those features are covered by multiple patents, is not a reasonable method of counting the value added by the patented features. If only 6/12 total features of a particular product are infringed by any of the accused patents, and we assume that each feature has an equal value, then the total value added of all of the combined patents cannot exceed 50 percent of the total product value. However, several of [her] value-add calculations assume that the combined value added of the alleged patents would exceed the total product value. . . . [W]hat is not possible, as a matter of law and logic, is that the [two] patents’ combined add more value to the threat engine feature than its total value. This is what [the expert's] report assumes by apportioning the value of the threat engine feature to both [patents]. . . . This flaw may be cured by amending [the expert's] total damages calculation to reflect a royalty base that does not exceed the total possible value added of the combined asserted patents." The court denied defendants' motion for judgment on the pleadings that plaintiff's exercise equipment patents encompassed unpatentable subject matter and found that the claims were not directed toward a law of nature or abstract idea. "Defendants argue that claim 16, and [one patent-in-suit] as a whole, are drawn to laws of nature, specifically focusing on the haptic equation mentioned in the last line of claim 16. This argument either grossly misreads the claims in the patent or stretches the rule in [Alice Corp. Pty. v. CLS Bank Int'l, 134 S. Ct. 2347 (2014)] beyond recognition. While it is true that the claim includes a formula, the claim is clearly directed at a piece of exercise equipment, and the formula is simply one part of the overall scheme. Including a law of nature as one part of a claim does not transform the entire scheme into an abstract idea. . . . The method claim in [another patent-in-suit] is a closer call. . . . However . . . the nature of the method claim is the operation of a piece of exercise equipment, like a treadmill, elliptical, or stationary bike, in order to simulate the conditions of running or biking outdoors. Unlike other patents which were determined to be directed at abstract concepts, the [patent] is aimed at a 'particular concrete or tangible form.'. . . It describes a way of running a specific type of machine in order to achieve a particular type of training. This is not the type of broad idea that threatens to monopolize 'basic tools of scientific and technological work' or 'the building blocks of human ingenuity.'" The ALJ granted respondents' motion for summary determination because the asserted claims of complainant's activity tracking patent encompassed unpatentable subject matter and found that the claims were directed toward an abstract idea. "I find both independent [claims] are directed to the abstract concept of collecting information about a user's physical activity based on thresholds stored in the computer memory. . . . [Complainant] does not contend that any of the physical elements of the claimed apparatus, including the removable component, the motion sensor, the computer memory, the circuity, the visual indicator, and/or the transmitter was unconventional at the time of the invention. . . .Thus, stripped of the conventional elements, the asserted claims recite nothing more than the naked abstract idea of an apparatus for collecting information about a user's physical activity based on thresholds stored in computer memory. . . . [Complainant] does not dispute that the idea of discounting minor movements that do not constitute physical activity (i. e., below the threshold) or the idea of setting a goal for physical activity existed in the real world. Computerizing those ideas through the use of generic sensors and generic circuitry does not make the idea less abstract. . . . Nor do accuracy considerations make a claimed invention less abstract." The court denied plaintiff's post-Enfish motion to reconsider an earlier order granting defendants' motion for judgment on the pleadings that plaintiff's underground location patent was invalid for lack of patentable subject matter because Enfish did not alter the court's previous analysis. "[U]nlike the patent-eligible claims at issue in [Enfish, LLC v. Microsoft Corporation, 822 F.3d 1327 (Fed. Cir. 2016)], which were 'directed to specific implementation of a solution to a problem in the software arts,' Claim 1 of the [patent-in-suit] is directed to patent-ineligible subject matter because the technological solution such claim purports to advance is the process of gathering and saving information of a specified kind, related to a locate operation, and 'not any particular assertedly inventive technology for performing those functions.'" The court granted plaintiff's motion for an interlocutory appeal of an earlier order granting defendant's motion for remittitur or a new trial on damages. "[T]he Court agrees with the plaintiff that there is a controlling issue of law on whether the Court must uphold the jury’s choice of a lump-sum format for a reasonable royalty in determining the maximum recovery for which there is evidentiary support. . . . This Court has not found a case where the Federal Circuit squarely addressed the issue of whether a district court can correct a damages figure on a motion for remittitur by extrapolating a royalty rate and base from the jury’s lump-sum award without express expert testimony explaining how to do so. . . . This case has been hard fought, lengthy, contentious, and expensive. It seems counterproductive to retry damages only to have one of the other issues necessitate a remand." The magistrate judge recommended denying defendant's motion for summary judgment that plaintiff's data transmission patent was invalid for lack of patentable subject matter because the asserted claims were not directed toward an abstract idea. "While there are some parallels between [defendant's] freeway onramp analogy and claim 21, the claim is manifestly narrower than 'traffic metering' and does not cover what happens at a freeway onramp. Claim 21 restricts its applicability to a 'wireless' device with 'a processor' and 'a memory.' Moreover, claim 21 does not cover delaying any data transmission by any amount of time; claim 21 is limited to delaying the transmission of a 'protocol data unit' (a specific type of data packet) by exactly 'an integer multiple of the current air interface transmission time interval.' Also noteworthy is the fact that claim 21 is directed to a purported improvement on an existing type of 'traffic metering' in the wireless network. . . . This is an archetypal example of an invention directed to 'improv[ing] the functioning of the computer itself' or 'improv[ing] an existing technological process' that Courts have repeatedly held to be patent-eligible." The court denied defendant's motion to dismiss plaintiffs' claim for a declaratory judgment that defendant failed to provide notice of commercial marketing as required by the BPCIA and rejected defendant's argument that plaintiffs could not privately enforce the notice requirement. "Defendant . . . [contends] that Plaintiffs may not privately enforce [the BPCIA notice of commercial marketing requirement]. Defendant argues . . . that Congress did not intend to create a private right of action, and where there is no intent, 'a cause of action does not exist and courts may not create one, no matter how desirable that might be as a policy matter, or how compatible with the statute.' . . . While this motion was pending, the Federal Circuit decided Amgen Inc. v. Apotex Inc., - F.3d - (Fed. Cir. July 5, 2016). . . . The Federal Circuit explicitly acknowledged that [the notice requirement] was 'enforceable by injunction.' . . . Plaintiffs do not seek any monetary damages for a violation of (8)(A). Rather, Plaintiffs explicitly request 'a declaration of its rights under the statute and injunctive relief requiring [Defendant] to provide [Plaintiffs] with legally effective notice of commercial marketing.' Absent the availability of declaratory relief, Plaintiffs would simply seek an injunction. . . . The Federal Circuit has already recognized the availability of injunctive relief for violations of (8)(A). If presented with the question raised by Defendant's motion, it would make sense to come to the same conclusion regarding the availability of declaratory relief." The court granted defendant's renewed motion for attorney fees under 35 U.S.C. § 285 after plaintiff's action was dismissed under 28 U.S.C. § 1498 because plaintiff's litigation positions were baseless. "[Plaintiff] (and [plaintiff's counsel]) knew that the Government had specifically expressed its authorization and consent to [defendant's] allegedly infringing conduct in this suit. . . . [Plaintiff] cannot seriously maintain that it had a good-faith basis for continuing to pursue its infringement claim. Not only was [plaintiff] on notice that its claims had legal problems, it knew exactly what those problems were because [defendant's] attorneys had sent several letters outlining the problems in detail. The record reflects that [plaintiff] continued to litigate the case even after it knew that it could not prevail on the merits based on strong precedential evidence. [Plaintiff's] continued pursuit of baseless claims that had no chance of success, combined with its inability to provide a good-faith basis excusing this conduct, demonstrate that this case is 'exceptional' and that awarding attorneys’ fees is appropriate." The court denied defendant's motion to dismiss on the ground that plaintiff’s patent for real-time indexing of multimedia data in response to detecting motion encompassed unpatentable subject matter because the asserted claims were not directed toward an abstract idea. "[T]he main thrust behind step one is to determine whether the claim moves beyond a long-understood concept or simply seeks to monopolize one by masking it through the medium of technology. . . . A court must, in other words, ask whether the claims are directed to a specific implementation to a solution to a problem. The point is not to deem ineligible any task or concept that can possibly be envisioned or performed by the human mind. . . . [O]ne could characterize a four-function calculator as an apparatus directed to the abstract idea of executing basic mathematical formulas by means of computer technology. The Court is highly skeptical that, if first invented today, such an invention would be found to be directed to an abstract idea at Alice step one based on this high-level description of the invention. It is worth reemphasizing that [Alice Corp. Pty. Ltd. v. CLS Bank International, 134 S. Ct. 2347 (2014)] is not a novelty test; it is improper to ask under Alice 'has this been done before.' That is a novelty question. . . . [I]t is clear that the [patent-in-suit] is directed to particular improvements over prior art multimedia data indexing techniques that render such data accessible in real time. At least on the face of the patent, this is a real invention designed to solve a problem, not mere implementation of the abstract idea of indexing data. . . . Where the patent explains how the claimed process improves upon prior multimedia data indexing techniques, thus enhancing a process that operates solely within the technological realm itself, the claimed invention will survive step one." The court granted defendant's motion for judgment on the pleadings because the asserted claims of plaintiff’s video streaming patents encompassed unpatentable subject matter and found that the claims were directed toward an abstract idea. "[T]he claims are directed to an abstract idea because the claims are not directed to an improvement in computer functionality, and the physical components of the claim merely provide a generic environment for carrying out the abstract idea. . . . The court is not persuaded that the claimed invention results in an improvement to computer functionality. [Plaintiff] did not invent the technology that converts video files into streaming format. . . . Moreover, [plaintiff] was not confronted with the problem of how to combine conversion technology and the Internet, or how to associate identification tags with video files. At most, the claims merely automate a sequence of known steps using conventional technology so that a human is not burdened with various manual steps. . . . The ordered arrangement of such conventional features provides no discernable benefits to computer functionality. This stands in stark contrast to claims which achieved such improvements to computing technology." The Board granted institution of covered business method review of a patent directed to fraud prevention in e-commerce transactions under 35 U.S.C. § 101. "The [challenged] patent . . . [provides] a system and method for verifying, authenticating, and providing notification of a transaction, such as a financial transaction, to at least one party represented or identified as engaging in the transaction while it occurs. . . . [T]he problem of insecure transactions may be amplified by the use of electronic systems, and clearly there are advantages to performing financial or commercial transactions using computer technology. This, however, does not, in itself, remove the claimed subject matter from the realm of the abstract as 'necessarily rooted in technology.' . . . [A]ll of the challenged claims recite elements of computers and computer networking. However, despite the setting and the purportedly computer network specific problem addressed, we are persuaded that the claims are more likely than not directed to the abstract idea of using an associated non-merchant party and a second communication link to verify the authenticity of a requested transaction taking place on a first communication link. . . . Nothing about the concept behind the challenged claims depends upon their implementation by specific computer or networking technology. In fact, the communication links can be implemented using conventional technologies such as 'wireline telephony,' 'fax,' 'paging,' and 'other widely used services and protocols.'" The court denied defendants' motion for summary judgment that plaintiff’s network device management patents encompassed unpatentable subject matter and found that the patents were not directed toward an abstract idea. "Defendants contend that the patents-in-suit claim the ability 'to measure impedance . . .' or 'a magnitude of direct current . . .' and '"distinguish" or "convey information" about the device based on the measured value.' . . . Simply because the claims require distinguishing information associated to impedance within the path does not mean the claim is abstract or could be performed entirely by a mental act. Indeed, the distinguishing information associated to impedance occurs over the claimed Ethernet wire path in the specific manner claimed. Defendants’ primary argument is that there is no structure recited to perform the association of the impedance within the claimed path. But Defendants fail to explain how this portion of the claim renders the entire claim abstract. . . . Moreover, the claimed invention is directed to resolving an Ethernet network specific problem — to provide a means for asset identification that does not use existing network bandwidth and therefore allows identification even in the absence of power." The court denied defendants' motion in limine to exclude letters plaintiff sent to defendant before the patent-in-suit issued. "The first letter . . . advised Defendants that a Provisional Application had been filed and recommended that Defendants 'avoid any practice of the invention that would fall within the scope of claims that will be included in the Utility Application.' The second letter . . . again cautioned Defendants about continuing to produce 'knock-off assemblies' and gave a technical description of Plaintiff’s invention. . . . Despite the intuitive merits of Defendants’ arguments on this issue, the disputed letters are relevant to the willfulness inquiry in this case. . . . [T]he letters are insufficient to show knowledge of infringement because no patent yet existed at the time they were sent. Nevertheless, they tend to show that Defendants were aware of the scope of what would be the [patent-in-suit]. . . . Thus, when Defendants later became aware of the existence of the [patent] on [the date they received actual notice], they already had some knowledge of its content. At the very least, the letter could tend to show that Defendants had 'knowledge' of the scope of the patent, which is relevant to the willfulness inquiry here."